Hersonissos is situated just 25 kilometres from Heraklion airport on the coast road towards Agios Nikolaos, the resort has a broad appeal with families couples and singles attracted to the resort's three beaches with their array of water sports. Families and teens will enjoy the Star Beach Aquapark - where only the brave take on the bungee tower and Kamikaze run. The resort's long waterfront is lined with dining options here you can find fast food, international cuisine or traditional Greek tavernas. 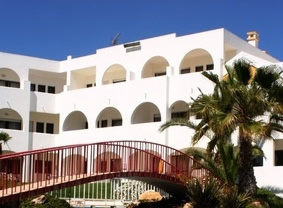 The resort also boasts one of the busiest night-scenes on the island of Crete. The cross section of dining opportunities is also matched by the differing accommodation from simple room only properties up to large hotels offering all-inclusive board arrangements. The resort is very lively in mid-summer with the bars and clubs attracting a much livelier crowd than at other times of the year. The bigger clubs such as the Matrix attracting large numbers of revellers with big name DJ's playing to the crowds. The beaches of Hersonissos wind around the town with lots of hidden coves and quiet beaches to explore as well as the popular Star beach. If you would like to spend some time away from the beaches there are a very good selection of designer shops along with the more traditional souvenir outlets. The Aquaworld Aquarium remains the must see attraction along with Lychnostatis Open Air Museum. The Arion stables is the place to book organised beach or mountain horse rides.